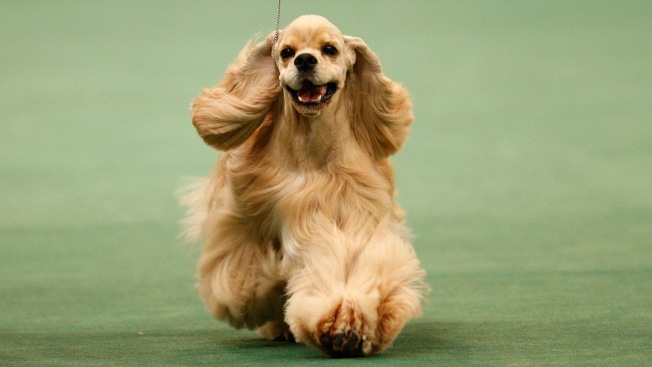 An American Cocker Spaniel competes in the 133rd Westminster Kennel Club Dog Show. The grave stone of one of its ancestors, thought to be the first Cocker Spaniel, helped A New Hampshire school qualify for the National Register of Historic Places. A New Hampshire school named to the National Register of Historic Places has an unusual feature on its grounds: the gravesite of a dog considered to be the father of the American Cocker Spaniel. The marble block at the edge of the Rollinsford Grade School's playground marks the remains of Obo II, who was born in the United States in 1882 and died in 1895. He was the offspring of two cocker spaniel show dogs from England. His owner, James Willey, owned part of the land now occupied by the school. The historic register application discusses the gravesite, which predates the school's construction but serves as a gathering spot for schoolchildren during recess and after school. The designation was announced Monday.